Description: Call of Duty: Black Ops is a first-person shooter with stealth and tactical play aspect that puts players in the role of a shadow soldier fighting in a variety of historically representative fictional Black Ops missions of the Cold War era. 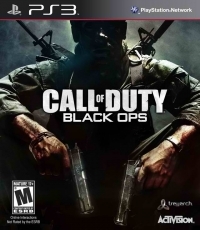 Created with the input of actual Black Ops soldiers from the time, the game mixes traditional Call of Duty tactical shooter gameplay with new gameplay options designed to expand the players' experience. Additional features include extensive multiplayer options, along with new vehicles and explosive new weapons. 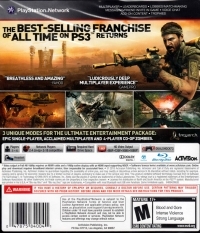 Box Text: The BEST-SELLING FRANCHISE of ALL TIME on PS3 returns. 07-23-2015 dirtymik3 Box Text The BEST-SELLING FRANCHISE of ALL TIME on PS3 returns. "Breathless and Amazing" "Ludicrously Deep Multiplayer Experience"
08-11-2012 mkarasch Box Text The BEST-SELLING FRANCHISE of ALL TIME on PS3 returns. "Breathless and Amazing" "Ludicrously Deep Multiplayer Experience"